Its over 100 degrees outside and naturally, I want a hot bowl of stew. I found an amazing recipe online that calls for wine in lieu of Worcestershire sauce. So of course, I. am. in! In a fever, I rush to the store to purchase the ingredients, I need everything except for the wine. I always have wine, I never know if I will need it for a drink…or recipe. When I get home I gather all of the ingredients and realize that the stew calls for 2 cups of wine…WAIT, what?!! I am now faced with the dilemma of “do I want to drink it, or cook with it?” It was a difficult decision but in the end, I had to chose the wine…. Just kidding, I put it in the stew, but not before having a small glass…okay I lied, I had a big glass. I am now typing away, very relaxed! I found this recipe on onceuponachef.com and did not change a thing with the exception of using different brands. Okay, there I go again, fibbing…I also used a slow cooker instead of the oven because, you know, lazy. I did sear the meat before putting it in the slow cooker. I also cooked the onions, garlic, flour, and added wine before joining it with the rest of the ingredients. Now I am patiently waiting for the meat and potatoes to become tender. And worth the wait it was! My taste buds were anxiously united with the robust flavors of the sauce. The meat, potatoes, and carrots were all cooked to perfection, not too soft, just the right amount of tenderness. 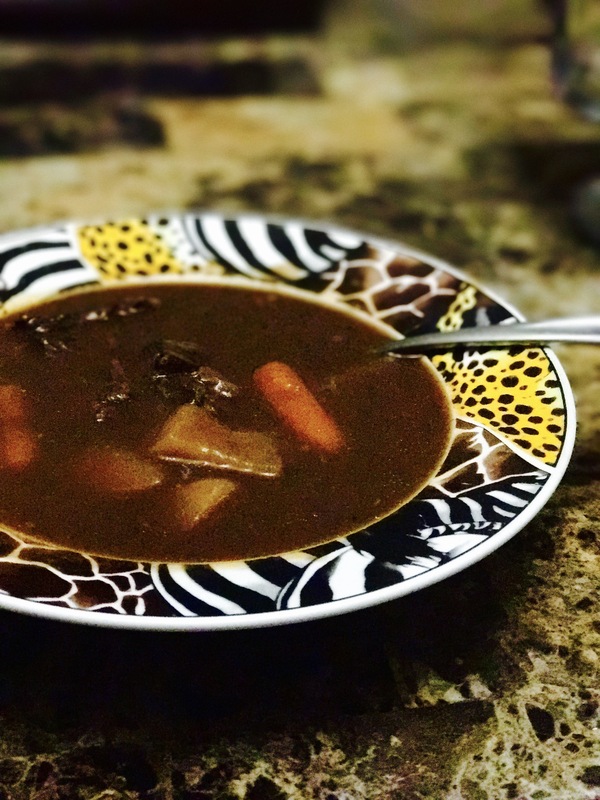 If you are hankering for stew I highly recommend this recipe!